This is the car from my parents who awarding me after I got my car driving license. 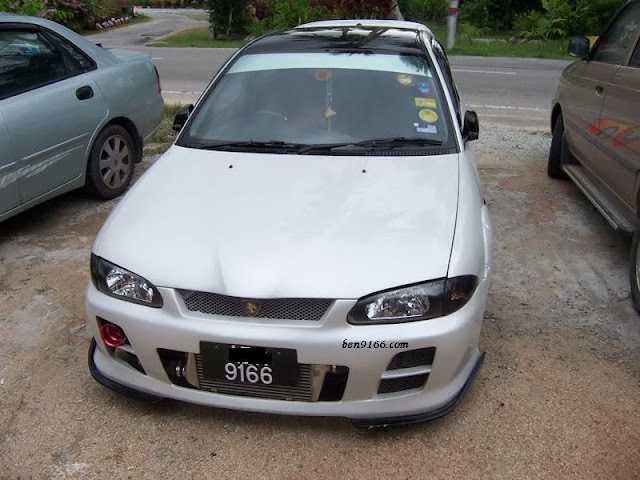 It is a local made Proton Satria and I understand that a lot of others definitely give negative feedback and a lot of criticism to Proton Cars. However, I am proud of being a Proton car owner. So for those who wish to talk something bad about Proton Cars, please leave this post alone. Started off with a fuel injection 4G13p 1.3L SOHC engine and a Siemens ECU which to produce about 80 hp on engine. Adding performance cam, exhaust system, cold air intake, an E-manage piggyback ECU and some other modifications will only bring you slightly pass over the 100 hp mark which this is not worth to invest as for me a performance seeker. After some consideration, a 4G93T 1.8L turbo engine producing 180 hp from the Mitsubishi Lancer is selected. The 4G63T 2.0L turbo engine from the Mitsubishi Evolution 3 is my preference but due to the rules regulation from our beloved JPJ (Malaysia Road Transport Department) whereby there is only 25% increase allowed from the original capacity. Anyway 1.3L to 1.8L is way over the 25% increment, and I did pay some amount of "money" to get it legally pass the JPJ and Puspakom inspection. After the conversion, some minor modifications are done to the car. An upgrade of the exhaust system is done to provide a better flow of the waste gate. Where 2.5" stainless steel from exhaust manifold join with 3.5" to a RSR s-flow muffler and since the exhaust tip is too big measuring at 4", therefore it was changed to a 3" tip to avoid attention from the enforcement. A VR4 intercooler with all the piping are upgraded but the drawback is the boost level is drop because of longer path and bigger intercooler which cause the pressure lost. A HKS air filter with a CAI (cold air intake) is installed as well. Some other modifications are done to the car to increase the performance such as ECU, FPR (fuel pressure regulator) and etc. Back into the cockpit, nothing much changes are done. But one can noticed that the dashboard is changed to the Mitsubishi Lancer dashboard with the digital air-cond controller. 2 extra gauges which are the Apex-i boost meter and the Apex-i RSM. 1 semi bucket seat and 4 points safety belt from Sparco are installed for more safety when having fun in the track. For the exterior, the car is finished with pearl white. A set of ATZ 15" rim wrapped with Yokohama Advan Neova AD07 is installed. Slotted disc rotor is fitted to provide better stopping of the car. Follow closely on the updates of this project car. Please follow my other project car, Toyota Celica. A very hot car.. is this PU or fibre bodykits? 5 star! I'm a GTi fans. You car look very fierce with that white pearl paint and smoked headlamp. Is that a custom made bumper? It look much better than original "Promote Bodykit". How much did you spend for the Bumper without the paint jobs? Thanks Matming. The bumper is original Promote where by it is one of the original design from Daiichi. 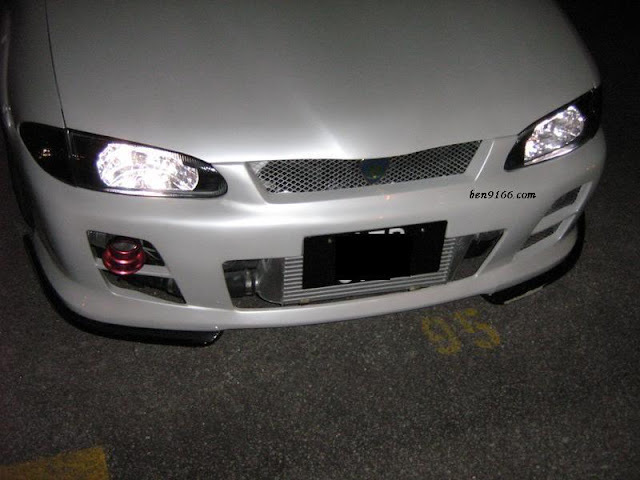 Only bumper, it cost me RM500. Matming, thanks for your suggestion. I already register an account for cardomain.com. If you have an account, do add me-ben9166. "...Started off with a fuel injection 4G13p 1.3L SOHC engine and a Siemens ECU which to produce about 80 hp on engine. Adding performance cam, exhaust system, cold air intake, an E-manage piggyback ECU and some other modifications will only bring you slightly pass over the 100 hp mark..."
mind to share how much does the above cost if you don't mind? i'm having the same spec as you mentioned and i'm thinking of besides converting the engine, i prefer to maintain the current 4G13 but thinking of improving "just-a-little-bit" on my belove satria. As i was driving this lovely car for almost 7 years since its new, i would like to see how far will it goes with the current engine but with minor upgrade of the other parts. furthermore, this car is only use in town and some outstation to my in-laws family at johor. i'm not a racing fan. so, i don't mind sticking it as it is. thanks. p/s: i can be reach at : jackdeman@gmail.com. just drop me a mail and i'll check it everyday. Hi Jack, Thanks for visiting. I have dropped you a mail. Do check it out. Hi, first of all nice car, very neat car. can i know what steering you are using? how much is that? Hi Benedict, thanks. I'm using MOMO EVO. Nice car you have there. A GSR engine transplanted huhu... Now GSR engine is damn expensive and even more expensive than an EVO engine. hye ben, im also using the same exact spec of satria..could u mind share how much is the cost to increase satria power to 100hp.. These will bring you to 100hp for your Satria. Btw, visited your blog and nice Satria GTi conversion. 1. is there any intake manifold that i can use to replace the current one?i dont really want to go thru the hassle to port n polish mine. 2.if there is, how beneficial is it? 3.instead of FI for extra power, i'm thinking of SC, do you think it's possible to DIY.if yes, can you name the most suited SC and the required components. 1. Yes. The MVV (Mitsubishi Vertical Vortex) manifold. 2. Better flow. If you change the engine head as well then there is a big difference. 1. what is MVV?or what car can i get it from? 3.do i need a piggyback to compliment the SC unit? 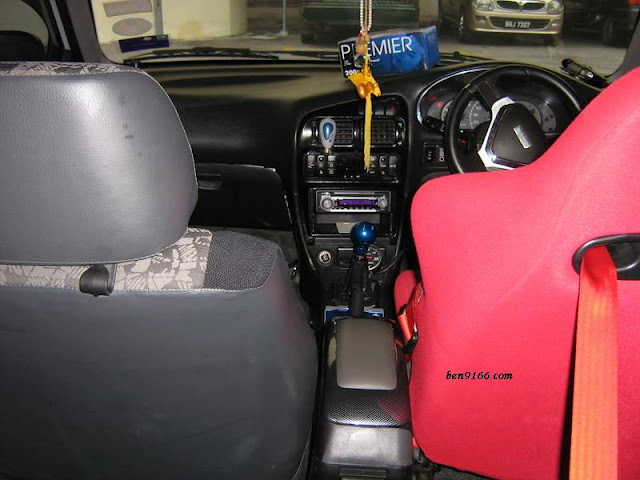 i googled and found the car.is the intake and head plug n play on our satria?pls explain further. 3. Yes, if possible. If not, you may use a fuel regulator to regulate the fuel that supply to your injector. Yes, it can fit to satria. dear ben. thanks for the info. next Q. what benefit i can expect by fitting the MVV intake and head? MVV was designed for lean burning can employ higher compression ratios and thus provide better performance, efficient fuel use and low exhaust hydrocarbon emissions than those found in conventional petrol engines. lastly, what actually do i need to PNP to my engine? You just need to get the whole set of the manifold and head. Then this will ease for the installation. I've been hunting for the head and intake since but to no success.it's really a let down. Any suggestion as to where can i get them? I am currently in Johor Bahru. I believe you need to go to KL bigger halfcut shop like Mun Lee to hurt the head and intake. Small halfcut shop will not store this kind of rare item as it is difficult to sell off. Looks like I'll have to put the libero project on hold.Will be passing my 4G15 to my daughter.Got myself another Satria fitted with 4G91 carb. I was told that EFI is better than carb in many ways. care to share on how to convert to EFI for my 4G91.How much would it roughly cost me? You may need a full set of wiring, air flow sensor and ECU to complete your mod. You can always opt from a 4G91, 92, 93. It will roughly cost you RM2k+ for this conversion. Thanks 4 the info.i'm planning to get the 4G93 wiring, ECU and stuff for the conversion.Since i'm fitting all the items from 4G93,i'm wondering if i can fit 4G93 head onto my 4G91?Any benefits? You can fit in 4G93 head. This is because the cam is different compare to 4G91 which may give you a bit of added performance. However, my advise is before you purchase the head please do inspect the cam code. Thanks for the heads up.btw can I have the cam code that you mentioned or is there somewhere that I can source for it? Here is the code you requested. All the information about is twin cam. You can get it from any accessories shop. I got it from a accs shop in BM, Penang. The smoke black tail lamp is the newer version while mine is the older version. What kind of ECU you plan to get? Standalone? Piggyback? 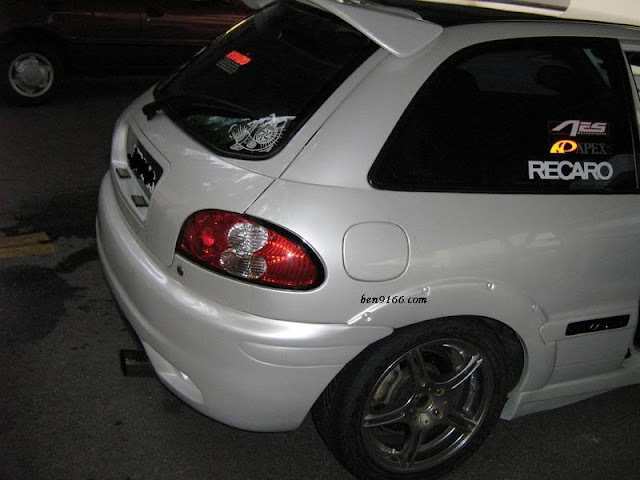 Hi ben, I have a 2001 satria gti 4g93 and just wanting to know of any performance parts you can recommend? Been thinking of getting 272 cams, better extractors, body kit (love your front bumper), cold air intake, ect. Is there any info you can give me on these and any more you can think of? Here are the replies I replied in the mail. 1.And im looking to do some performance modifications. One problem i have is i want to upgrade my exhaust but still want to keep the original dual exhaust look. I cant seem to find any upgraded dual exhausts out there? Do you know of anywhere i can find them? You may opt for RSR exhaust. 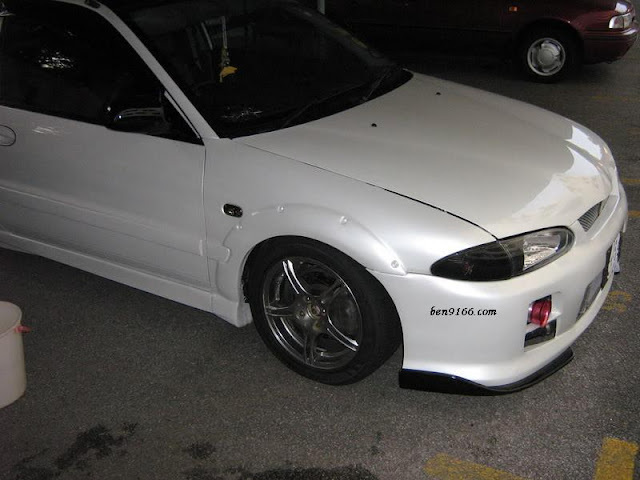 If you noticed that my white Proton Satria, I'm using RSR but modified to single tip. 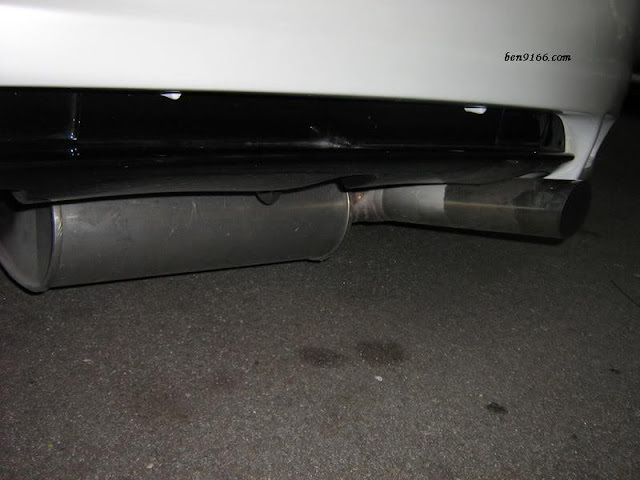 So it is possible for you to remain the dual exhaust tips. 2. Also cant seem to find any cold air induction kits for my car? Is there any out there? There is no CAI intake made for Proton Satria. However you may buy a CAI hose and route it to your intake. 3. Im wanting to upgrade my cams to a 272... will that be a good cam to fit? Do i need to upgrade anything else to fit this application? If your car is a daily driven car, I recommend to use 260/270 instead of 272 coz it is a bit high for daily drive car. You may opt kelford cam. 4. What computer management upgrade would you suggest for better performance? Emanage ultimate would be sufficient. However this is always depends on the availability and tuning expert in your country. 5. Also with extractors if you have any info on which would be good for my car? Any tuned length extractor will be ok. 4-2-1 for better low end and 4-1 for better top end. 6. And on your website you have shown a white proton if you can recall. Just wanting to know how and where you got the front bumper? That's my car. The bumper is custom made by Si-Design which out of business a couple years ago. However there are a lot of replica around in my country.